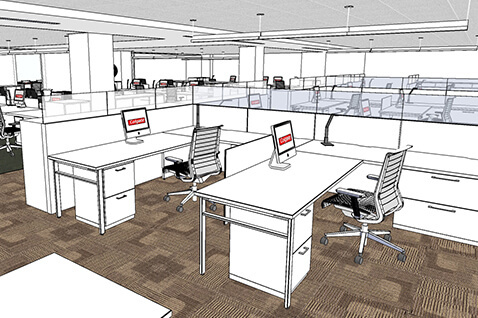 Fortune 500 company Colgate had an ambitious plan for a new workspace. It involved sourcing highly customized high-end furniture, recouping the value of their existing assets, and to complicate matters, it also meant meeting an aggressive timeline. Davies proved to be the only manufacturer or remanufacturer capable of getting the job done. As the country’s leading remanufacturer, Davies was able to custom design and modify product to meet Colgate’s unique needs—accessing the quality and quantity of veneer required to complete the project on schedule, and working closely with the client’s architect to achieve a stunning, one-of-a-kind look. Davies on- and off-site project management team ensured that everything went smoothly. Colgate was also able to defray the cost of the build-out by depositing their former assets into Davies’ Product Exchange and Banking program—and no less important, keep their surplus out of the waste stream. We love the flexibility, custom capabilities and innovative ideas they always bring to the job, and we’ve been delighted with the results. And the fact that Davies is a woman-owned business was also a plus, particularly given that ColgatePalmolive is a publicly traded company. 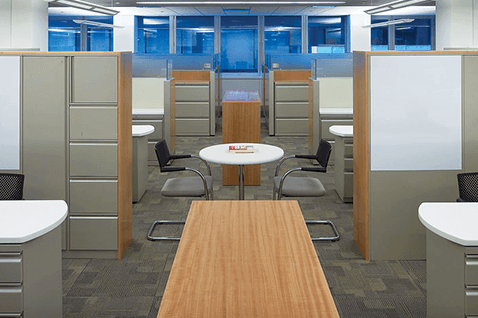 Take the next step to customize your sustainable workspace.